Forget the Indy 500. The wildest auto race on the planet takes place every summer in Tillamook, Oregon, where daring drivers race “stripped” Model T's while hugging live pigs! 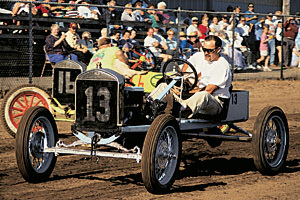 Pig-N-Ford races have been held for over 40 years and often attract standing-room-only crowds to the Tillamook County Fair grandstand. The Model T's (with bodies removed) line up in the middle of the track, and the drivers line up against the fence. At the sound of the starting gun, drivers sprint across the track to the pig boxes, grab a pig, then hot-foot it back to their cars. With a pig under one arm, each driver hand-cranks the engine with the other. Then they jump aboard with their squirming co-pilots and chug off around the track. Pigs are traded at each lap, so coming around the final turn, drivers jockey for positions as close to the pig boxes as possible. Tires spray showers of dirt as the cars skid to a stop. You've never heard such a crescendo of squealing, engines roaring, drivers yelling and crowds cheering for their favorites! Over the years, there have been plenty of laughs, some close races and lots of losses by a… well, by a pig's nose! The Tillamook County Fair is held the second weekend in August, and the races start on the Thursday before that weekend. They go on for 3 days until the field is narrowed to six participants. Two races are run each day starting at 5:30 p.m. Winners compete in the World Championship Finals on Saturday. Afterward, the winner circles the track, holding aloft the coveted Pig-N-Ford Championship banner. The Tillamook County Fairgrounds are bordered by Third Street, Brookfield and Marolf Roads. For updated information, call the Tillamook County Fair office, 1-503/842-2272, or the Tillamook Chamber of Commerce, 1-503-842-7525.